This past week has been, and still is, a crazy one for me. Although it may seem like I’m not doing much since I’ve hardly left my house in days, I’ve been chained to my computer and working long hours. My office is starting to look like a scene from that old movie, Hackers. Of course, the remains of the food littering my floor is all gluten-free. You won’t find any Dominoes boxes with half-eaten pizza around my desk and I’m not being chased by an evil computer genius and don’t have a cool nickname like Crash Overdrive or Acid Burn, but nonetheless, I’ve been frantically busy wearing off the letters on my keyboard (seriously, I’m not kidding). It’s a good thing I have that 21st century, Darwinian memory chip in my brain labeled “keyboard characters” or I’d be in big trouble. Not that you’re probably interested, but I’ve been doing some high res scanning of old ski photos, then cleaning them up in Photoshop, then passing them along to the nice people at Alpenglow Magazine for a feature story they’re doing on vintage ski fashions. Things like that always take longer than you anticipate and there are often glitches along the way, but it was a fun project. In between ski fashions and my regular life, which has been incredibly limited lately, I’ve been working away at two different Power Point presentations on celiac disease. Actually, I’m using Keynote instead of Power Point since I’m a Mac girl. It’s the same program Al Gore used to produce AnInconvenient Truth. Results may vary as my end-product won’t win any Academy Awards and villous atrophy, while microscopically fascinating, isn’t as on-screen dramatic as large coastal cities being engulfed by rising seas. So, no Emmys and no Academy Awards (not to mention Nobel Peace Prizes) for me, but I have been busy making slide after slide on the pathogenesis and treatment protocols for celiac disease. Once I’m finished, I’ll post a few of them on my blog for “educational purposes only.” It’s interesting stuff for sure and the increased awareness and advances being made in diagnostic testing and treatment are long overdue. More on all that later, but for now, I thought I’d post some alternative flour information from the “Nutrition Therapy” part of the presentation I’m creating. These are all flours I use, although I haven’t tried the green pea flour yet. I plan to do that this weekend, so I’ll fill you in on how ground green peas taste in muffins. Or how muffins look tinted lime green. Viridian sounds more exotic than lime green. I’ll call them “viridian protein muffins” since peas have a good share of protein. Hmmm? Should be interesting. One thing I’ve learned about living gluten-free is not to make assumptions. Some of my best creations have come from combinations you would never except. Mesquite and sorghum flour; millet and quinoa; amaranth, almond, and teff. The abundance is actually a bit overwhelming! This may sound rather “Pollyanna-ish” but I feel blessed to have celiac disease. Post-celiac-syndrome is more like it since I don’t like the word “disease” and actually don’t have one at the moment, thank you very much. It’s not a big deal to me to give up wheat and without celiac disease, I never would have jumped into this silo of delightful and exotic alternative grains and flours. It’s a gift in my mind, not a burden, and with a little creativity and a flair for gusto, you can live much healthier than in your pre-celiac-diagnosis days. Here’s a taste of some exotic flours to consider adding to your pantry. Unfortunately, non of this comes cheaply. “Alternative” flours are usually more expensive and often require special orders, but things are changing and more of these choices are hitting the shelves of natural food stores. Bug your local grocer to add some to their shelves. 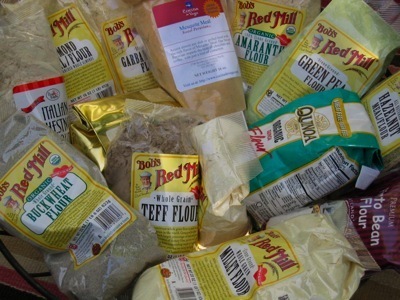 You can also order most of them on-line from Bob’s Red Mill, which is a wonderful source for GF flours, grains, and even recipes. Wheat? Boorrring . . .
And there are more, but this is a good start. The world of gluten-free is a world of abundance. No whining! P.S. My “oil crisis” post is in the works. Stay tuned. This entry was posted on Saturday, October 20th, 2007 at 4:57 pm	and is filed under Celiac & Gluten Intolerance, Gluten-Free Recipes. You can follow any responses to this entry through the RSS 2.0 feed. You can leave a response, or trackback from your own site. No, so you’re not acid burn? yet …. thanks for the list of flours, I keep telling my family there are a billion fun options. They, however, think gluten free means unhealthy unless you (poor thing, awww) have Celiac. Sigh. I’ll send this to them! I love you pile of flours… it looks like my cabinets which are frightening. Please post how you use the green pea flour, it sounds good. Soup? Muffins? Maybe a vegetable egg “strata” or casserole/bake? Hmm…. Cindy — sorry about the Outback dairy incident, that’s no fun. Especially when you’re busy dealing with quasars and exploding stars. You don’t have time to feel like poo! You’re a busy little astro-girl.